At times, the mere idea of narrowing your college search can feel so overwhelming that you’d gladly tackle your Algebra II homework instead. Given time and cost constraints, it’s unrealistic to assume you’ll visit all of the schools you’re initially considering. And you certainly don’t want to turn your bedroom into a mere storage locker for college pamphlets and marketing materials. So, what’s arguably the most effective means of research? We suggest the internet (you know you’ll be spending your evening tweeting anyway). To begin with, a simple Google search will yield a number of different college advice sites, including this one, My College Options. In general you can utilize these websites to figure out different search criteria you should be considering. Do you want a small liberal arts college or a bustling university? Is going to school in a city mandatory or do you think you’ll relish studying in a rural environment? Beyond these basic questions, you can also learn how to assess your chances of admission (within reason) at a particular school. Additionally, a quick online search will kick up a myriad of ranking lists, put together by a variety of publications and organizations. You’ll discover lists for everything from “most bang for your buck” and “best video game design programs” to more general rankings for best schools overall. These might be a good starting place if it’s vital that you attend a university with a stellar engineering program, a college that actively promotes studying abroad or simply a top-rated institution (for example). Keep in mind that no ranking is perfect and rankings themselves are often over-hyped. It’s easy to get caught up in the idea of the “best” school, but what you should really be focused on is finding the best school for you. If you’re at a complete loss for how to get started, there are a handful of college search tools available as well. These online surveys will pose a multitude of questions and generate a list of potential schools based upon your answers. If you’re curiosity is piqued, we recommend trying My College Option’s very own college search tool. 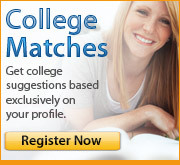 Once you have a list of colleges you’re seriously considering, click on over to each school’s individual site. Though surfing a website might not illicit the same gut reaction as an on-campus visit, you can definitely glean a good deal. To begin with, many schools offer a virtual campus tour. You’ll be able to check out some of their facilities, viewing images and learning what different buildings have to offer. For example, you might see that the campus museum has a Chagall or that the new eco-friendly student center was designed using repurposed materials. Moreover, you can begin to gauge social life by checking out the different events being offered throughout the week. Maybe there will be a concert or lecture that catches your eye. If you’re a sports buff you can look up team stats and maybe even stream a game. You might be able to listen to a show being broadcast on the campus radio station or skim an issue of the school’s weekly newspaper. The bottom line is that you can start getting a taste of a college’s particular flavor. While extracurricular activities and events certainly make college fun, we’d be remiss if we neglected to mention that you can also look up the various academic departments a school offers. You can research requirements, both at large and for individual majors. You’ll be able to scan course offerings, investigate professors and even read about research projects currently being conducted. And you can confirm the school offers any course of study you’re considering (in fact that should probably be a priority). We should also note that even if you are planning a campus visit, it’s always good to surf a school’s site prior to your trip. The more you familiarize yourself with the college, the more you’ll be able to get out of the visit. You will ask targeted questions and arrive knowing what campus hotspots are a must see. Of course, it’s also important to take everything you see on the site with a proverbial grain of salt. While you can certainly trust the information you read, you should recognize that a website is still a marketing tool. Colleges and universities are going to use their site to put forth the best they have to offer. You won’t necessarily see quotes from students who are having trouble registering for necessary classes or thinking about transferring. You might not uncover photos of dorm rooms with leaky ceilings or peeling paint. Therefore, while you can totally get excited over the phenomenal planetarium or the dining hall menu, realize that no matter how polished a site is no school is perfect. If you’re still not satisfied after surfing a school’s site, consider turning to YouTube. Many colleges and universities upload clips and short videos. Though some are definitely produced through a marketing or public relations department, others are amateur productions filmed by students themselves. You’ll find (many) a capella concerts, snippets from debate competitions and even just personal vlogs that capture college life in general. Listen – we figure you’re already internet savvy. After all, you’re reading this article. You use the web to connect with friends, complete school projects and to simply have fun. Therefore, it only makes sense that you’d utilize it for one of your biggest endeavors to date: the college search.